At a fairly young age, it became clear that my dreams of playing point guard in the NBA or tailback in the NFL were a longshot. So I decided the next best thing would be talking about sports. I started my journalism career at the University of Hawaii, working on the student newspaper and campus radio station. Through my years in the islands, I covered everything from erupting volcanoes to sumo wrestling, to play-by-play of my beloved UH Warriors. I moved to Northern California just in time to experience the 1989 earthquake and was actually driving through the Caldecott Tunnel during the quake (it didn't move an inch, by the way). After 5 1/2 years at KTVU, I left for ESPN and spent the next 6 years hosting SportsCenter alongside Robin Roberts, Keith Olbermann and Dan Patrick to name a few. People always ask why I would ever leave national television to return to local TV, but for me, it was all about location and lifestyle. So, in 2001, I happily returned to the Bay Area to work for ABC7 News. When I'm not working, you can find me working out or naturally, watching sports. The P-90x DVD workout series is a favorite because it feels so good once it's over. Follow me on Twitter for news and sports updates. If you ever have a story idea , or thoughts on what we're covering, tell me about it on Facebook. 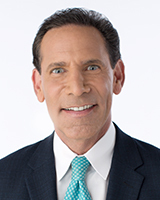 Larry Beil co-anchors ABC7 News weekdays at 4 p.m. He also covers sports for ABC7 News weekdays at 6 p.m. and 11 p.m. During basketball season, you'll see him co-host ABC7's post-game show, "After the Game." Larry has been with ABC7 News since 2001. Reggie Aqui challenged sports director Larry Beil to go out of his comfort zone and talk about musicals. Larry Beil has responded with authority! SURPRISE TRIBUTE! ABC7's Dion Lim used to be a news anchor in Charlotte, North Carolina. When our sports team was there covering NBA All-Star weekend, they asked around to see if anyone remembered Dion. After pranking her, and telling poor Dion no one knew who she was anymore, they surprised her with this hilarious video. Even Warriors' Klay Thompson got in on the fun!